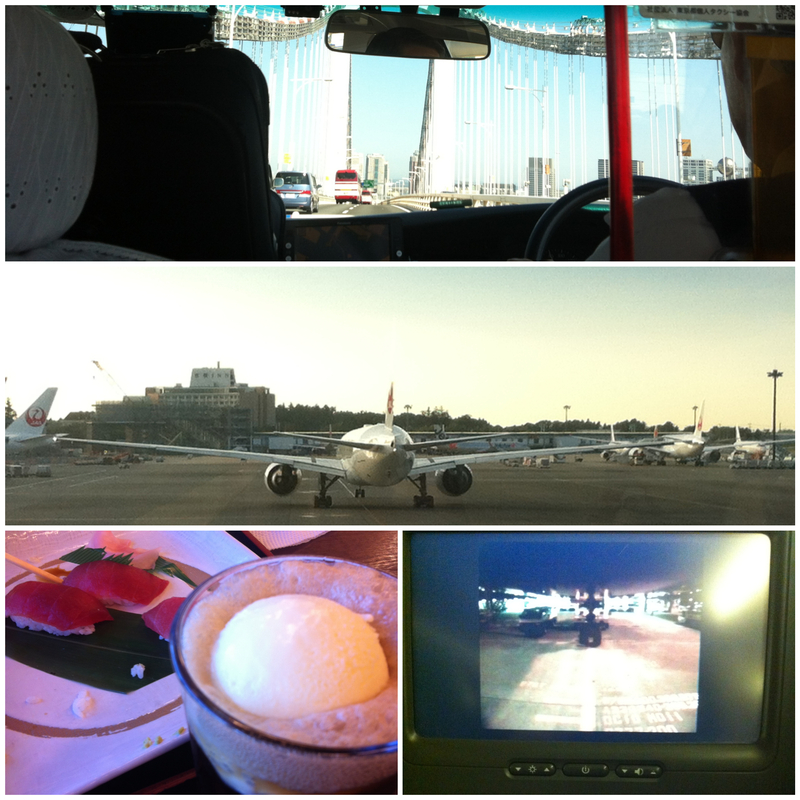 From top…our interminable taxi ride with the blind driver; last views of Narita, last meal (coke float and sashimi) and the fabulous bird’s eye view camera from the plane! So we’re home. Getting home was a trial. Normally I have things fairly well planned and organized but there were things out of my control on this one. First of all, we bought our tickets on CheapOair. Not my first choice…actually pretty much one of my last choices, but I have to say it was fine AND a great deal. We flew Cathay which was fabulous (more on that later) but at first I couldn’t confirm our tickets on the Cathay website with the locater number from CheapOair so I was freaking out. CheapOair actually emailed me back and confirmed the flight and told me how to get on the Cathay site. Next, I couldn’t print a confirm as Karis’s computer was not downloading files to ANY flash drives (yes, I did buy a new one, didn’t work) so I had no printed confirms. Wanting to cover all my bases, I emailed the boarding passes to myself and Karis; downloaded the PDFs and screenshot each one. Karis’s agency made reservations on the airport limousine, paid her fare and the cab to get to the bus and provided a map and instructions in Japanese for the cab driver. When I lived in Japan before, it was almost impossible to get a taxi to stop for a foreigner and you had to have a map and/or instructions in Japanese as there are no regular street names or addresses. I had all of this. Also, one of the bookers happened to be at the apartment as we were leaving so he helped load the car and explain (again) to the cab driver in Japanese exactly where the hotel was…literally a 5 minute drive from our apartment. Anyway we did everything exactly as instructed but we didn’t count on a cab driver not be able to find the hotel! With Japanese instructions, a map and a GPS! Though perhaps the fact that he kept looking at the map with a magnifying glass should have been my first clue. We missed the limousine bus. Luckily I still had my Japanese phone and called Yusuke at the agency and he talked to the cab driver but it was too late. Yusuke was trying to find another bus and was going to book us on the Narita Express which is a high-speed train. I explained there was no way this would work as we had too much luggage to manage on our own because it involves changing trains and going through the station. He then spoke to the driver again and told us he would drive us to Narita. At this point, I didn’t care as there was no way we could miss this flight. Cab fare to Narita is about $300. So we’re driving and driving. Both Karis and I have to pee, like crazy. We finally get to Terminal 1 (as per Yusuke’s instructions) and Karis sprints out to go to the bathroom. The driver and I unload the car and I ask him the fare…on the meter it says 29000Y. He keeps repeating, “chigau, chigau, no fare.” I finally understand that he means not to charge us because it was his fault that we missed the bus. I insist on giving him 10000Y which he reluctantly accepts and bows until I enter the terminal building. I looked back and he was still bowing. After the bladders were taken care of, we look for Cathay. And notice that it’s in…Terminal 2. Yusuke sent us to Terminal 1 because our original flight home was on ANA which is in Terminal 1. Sigh. Two floors down to the bus stop; load up the bus with our five suitcases, one carry-on bag and two purses; ride to Terminal 2; disembark with our five suitcases, one carry-on and two purses; wait 15 minutes for an elevator to the departures level–they’re always full because people are loading up on the floor below so we can never get on. We finally break protocol (serious thing in Japan) and get on an elevator going down and don’t get off just to we can ride back up again. Otherwise we’d still be there waiting. Finally arrive at Cathay which is glowing like a beacon in the distance. I love Cathay. The opened up a desk to serve us, printed our boarding passes, checked in four huge overweight bags for free, all with great professionalism, kindness and speed. A quick visit to the cell phone return counter, a snack and a pit stop to buy Hello Kitty pens and we’re on our way. Longest flight ever. The food was great (for airline food), great service, personal TV screens, free blankets, pillows and headphones. And my very favourite thing…they have a camera on the bottom of the plane so you could watch the take-off and landing. I’d definitely fly Cathay again…but it was a bit frustrating to fly BACK to Hong Kong, then to Vancouver over Japan. Our direct flight was a little over 9 hours…this was over 21 hours. I was ready to jump off the plane about 3 hours into the second flight….